Chiaroscuro, which in Italian literally means “light-dark,” is a term used in the visual arts to describe a work that utilizes strong contrasts of light and shade in its composition. Painters noted for their use of chiaroscuro include Leonardo da Vinci and Rembrandt, among many. In still photography, the technique is frequently referred to as “Rembrandt lighting,” while the candlelit scenes in Stanley Kubrick’s Barry Lyndon stand as a famous cinematic example of chiaroscuro. 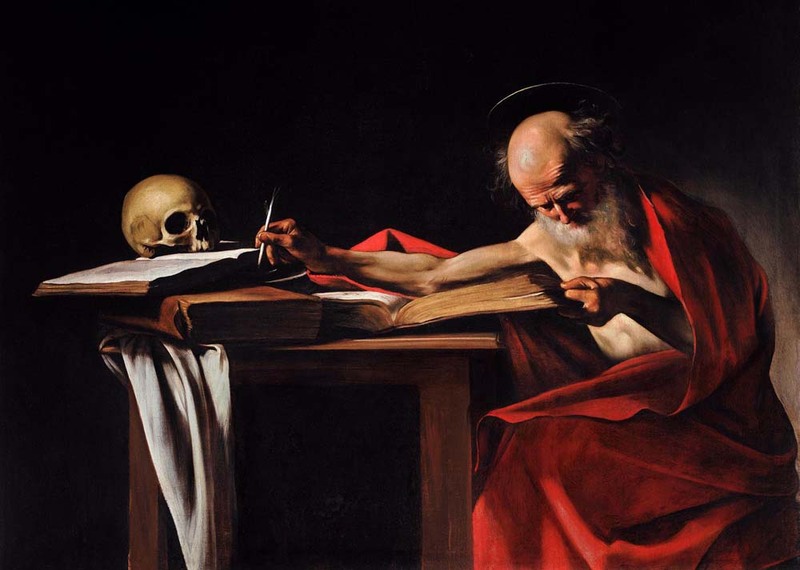 Perhaps the most dramatic exponent of the technique was Caravaggio, whose works – such as Saint Jerome Writing, pictured here – use bold, even harsh lighting to highlight the main subject and intensify emotional states. In a bit of pure serendipity, the Teatru Manoel in Valletta, Malta where I will be performing next month is a short walk from St. John’s Co-Cathedral, home to two Caravaggio paintings including The Beheading of St. John the Baptist, one of the artist’s greatest masterpieces. In the meantime, I am looking forward to exploring the idea of musical chiaroscuro with the next concert of the Montclair Orchestra’s 2018-19 season. (A note to bel canto enthusiasts: I am not referring here, as a voice teacher would, to the balance of light and dark in a singer’s voice, but rather to the interplay of light and shade in the scores themselves.) The program as a whole displays a type of “global” chiaroscuro by setting the midnight atmosphere of Ligeti’s Ramifications (1968) against the sweeping melodies and sunshine of Tchaikovsky’s Serenade for Strings. Similarly, the scurrying, sardonic wit of Shostakovich’s First Piano Concerto is contrasted against the long, aching phrases of the Adagietto from Mahler’s Fifth Symphony. However, each of these four pieces also exhibits an inner struggle between light and shade. Ligeti’s amorphous microtonal textures give way at times to gleaming points of light; Tchaikovsky’s irresistible sunshine is also tempered by the hauntingly wistful opening phrases of the third-movement Elegy. The Shostakovich, which will feature sensational pianist Gilles Vonsattel and MET principal trumpet David Krauss, offsets the pervading darkness with brilliant outbursts from the trumpet. As for the Mahler, suffice it to say that for decades commentators assumed that the Adagietto was about death, only to discover later it was inspired by the composer’s love for his young wife Alma. Certainly both are present, and where there is love, there is also life; undoubtedly the tension between all these elements is a major reason why the movement is so poignant and memorable. If you’re in the area, don’t miss this performance! It’s on Sunday, November 18 at 7:00 pm, and tickets are available online here.